There's nothing quite like seeing your work come to life in the printed form. While it's nice to see your images on your computer monitor, there's a special something about having a physical print of an image that you can hold and present. For photographers new to printing, however, the entire process can be daunting. Buying and using a printer can be expensive, getting your prints to match what you see on your computer is far from straightforward and even selecting the right photo paper for a specific image can be challenging. 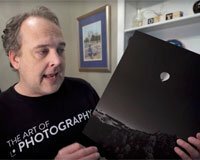 In the video below, photographer Ted Forbes of The Art of Photography discusses the topic of printing and why it's important to print your work. For those just getting their feet wet with printing, a great way to jump in is by selecting one specific image and printing it, either at home or via a service, on a variety of paper types. You can see how different types of paper make the image look and feel. In general, there are two general types of photo paper and they are separated by their finish: glossy versus matte. Within these broad categories, there are other considerations including paper thickness and weight, texture (smooth versus textured) and more. Depending on which type of paper your image will be printed on, you may want to alter your processing techniques. For example, as Forbes mentions below, the texture of a paper can show itself differently depending on the brightness values of your image, with highlight areas (bright areas) showing more texture. Black levels are also important to consider when printing because not every paper is capable of displaying as wide of a dynamic range as other papers, which could adjust how you process black and white images in particular. On a personal level, I love printing images. I think it's the ultimate culmination of the photographic process and its value cannot be replicated digitally. Being able to share your work with others in a tangible way is really satisfying, as is learning the new skills required to make good prints. I understand that photography is already an expensive hobby and adding even more cost to the process might not sound very appealing, but every photographer owes it to themselves to give printing a try. If you would like to try out the Adorama Pix printing service that Ted discusses in the video above, you can click this link and use the code "ted20off" during checkout to save 20 percent on your order.